Surprise the man in your life with this personalized gift with a special message! Any man is sure to love this gift, because it’s beautiful while keeping its masculinity. Record your message and have it visually printed onto a canvas for his office, above the mantel, in his mancave, or hang it up in your bedroom. The possibilities are endless! 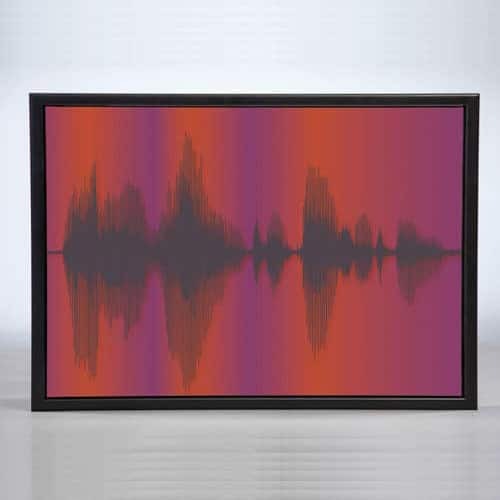 With many different style combinations, this canvas can be recorded with a heartfelt message, wedding vows, or the sound of his canine best friend barking. Choose colors to complement whatever room he will hang it, and give him this beautiful canvas with a loving, visual keepsake message. If he’s a bit of a sports nut, create the canvas in his favorite team’s colors and record their fight song or famous chant. It’s completely up to you to personalized it however you like, making this the perfect Christmas gift for the man in your life!